When your licence comes to an end you will need to buy a licences, you do not need to reinstall the software you simply need to update your license activation code. 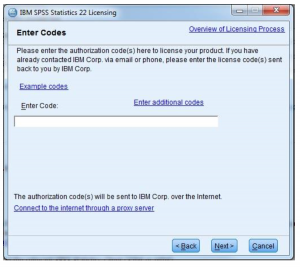 We will supply you with a new code at the point at which you buy the new software licence. To update it, simply follow the instructions below. What happens at the end of my free trial or when my licence comes to an end? 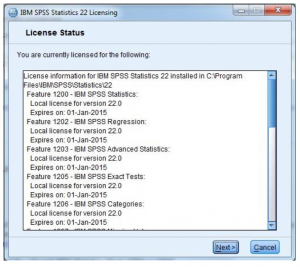 If you are going to be running a paid installation of SPSS Statistics or Modeler on the same machine that you used for the free trial then you do not need to download the software again. You simply need to update your license activation code. We will supply you with a new code at the point at which you buy the software. To update it, simply follow the instructions below. You do not need to download the software again. 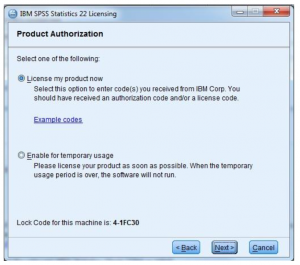 You simply need to update your license activation code. We will supply you with a new code at the point at which you renew your licence. To update it, simply follow the instructions below. 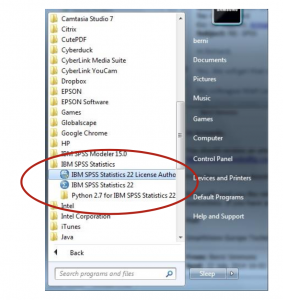 Locate the SPSS License Authorisation Wizard. This is in the Programme Menu in Windows. If you’re using a Mac then navigate to this via your Applications folder. Click on the License Authorisation Wizard. You’ll then be asked for permission to run the license manager. Click yes and the current license status will then show. You can enter additional codes following the first code to activate multiple products.